This machine was built around 1927, and is serial nr. 16238. 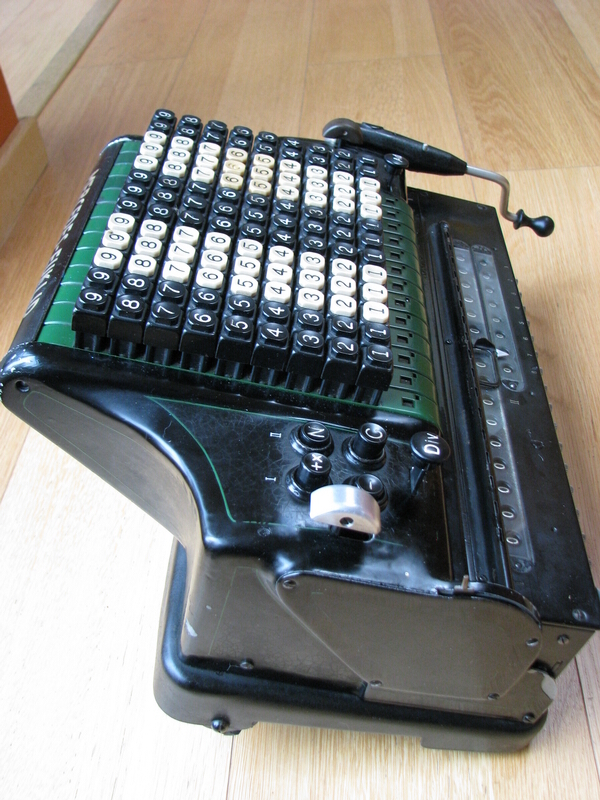 When I bought it, it had several issues - the most important of which was that one column of the keyboard would only switch between 4 and 5, never clear completely, and thus, through the in-built security features, completely stop the machine from working. 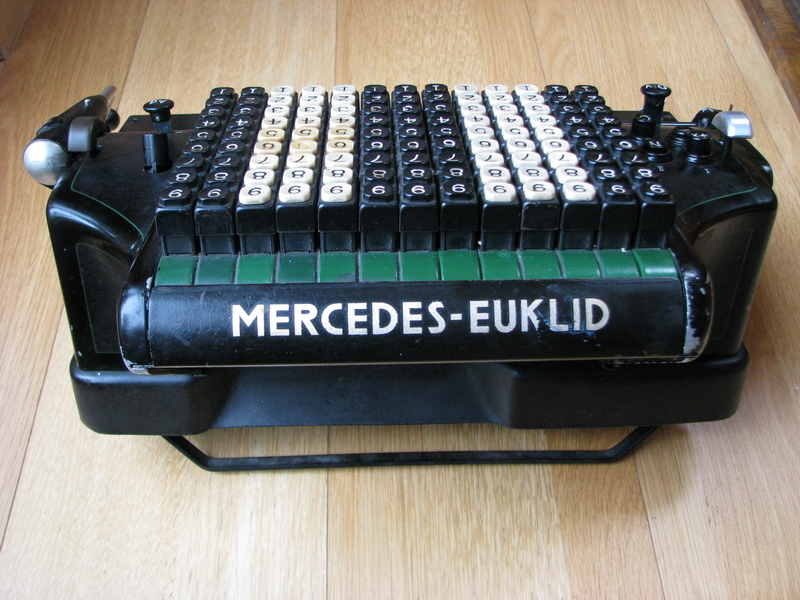 This problem was solved by completely disassembling the relevant column of the keyboard - an exercise that is not for the faint of heart, because it is like a chinese puzzle box - apart from the fac that it is kept together by bent steel tabs, which are weakened every time they need to be straightened and bent again, there are pins that have to line up with holes, in order to be driven out to undo one component, which will then even the path for undoing the next ... it was a total nightmare. In addition, at first I couldn't find what was binding - everything seemed fine. (the fact that you need to bend the tabs to keep everything in place stops you from methodically adding one component at a time and testing the functionality - either you put it together and it works, or you hav it apart, and pushing a button will launch parts everywhere ...) However, when it was all back together, the symptoms would return. 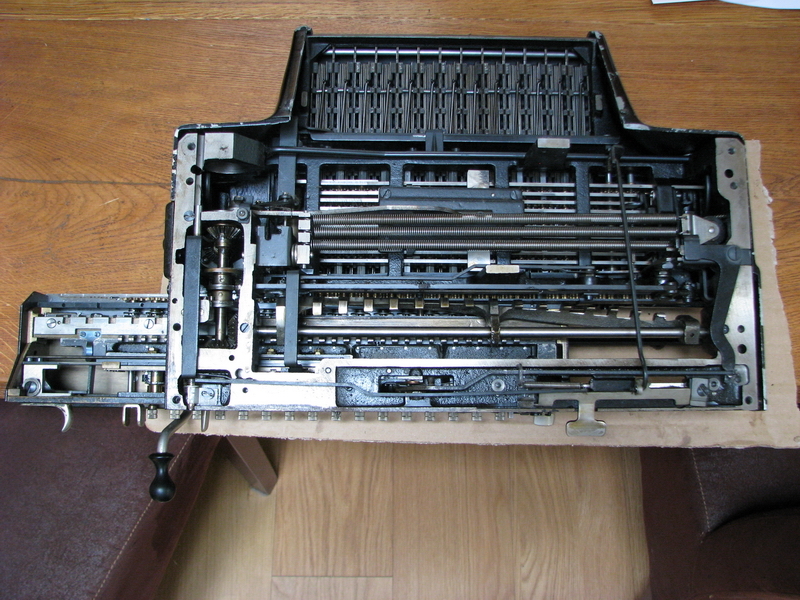 In the end, by some judicious deburring and filing, I got it to all work smoothly, but it is absolutely beyond me how the machine can ever have worked properly, and why it was not taken in for repair in 1927. The problem was definitely not due to wear in the keyboard mechanism, it must always have been there. 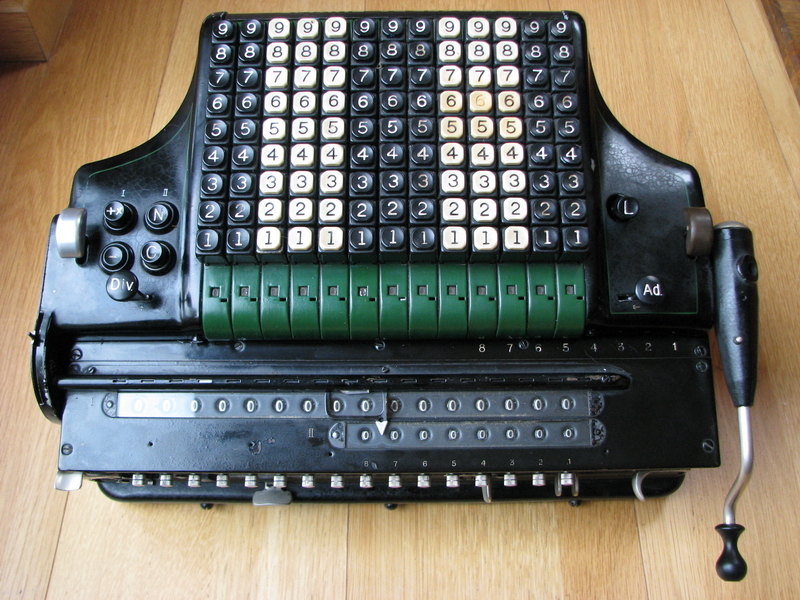 Other than that, the carriage return, which is also a necessary component for making the automatic division work, stubbornly refused to operate properly. The carriage is moved by a chain connected with a pulley to three large springs in the bottom of the machine. I shortened the chain by about 3 cm to put more tension on the carriage. This had some effect, but it was not until I realised that one of the steel wheels the carriage is supposed to roll on was stuck on its axle, that things really started improving. 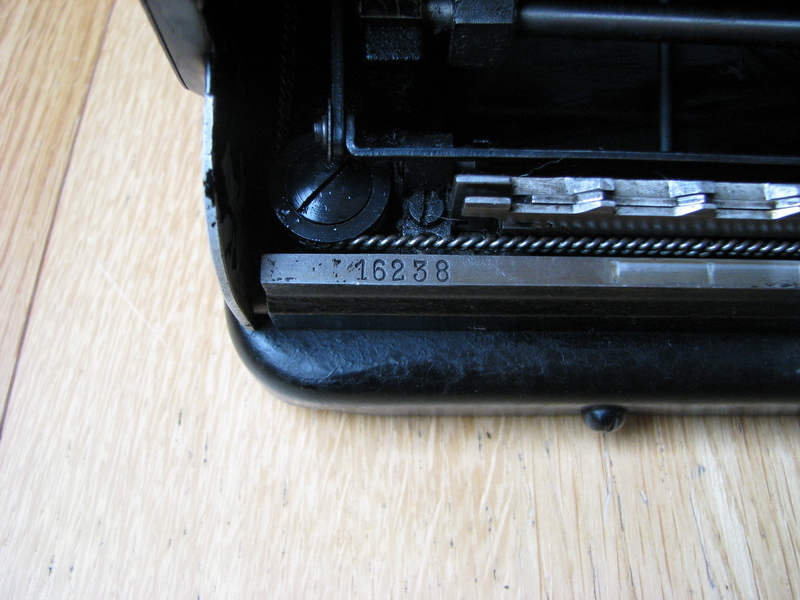 These are some pictures which show you most of the mechanism, with part of the keyboard, and the rack drive for transferring the numbers to the result register. On top of everything are the three large springs. On the left of the picture, the bevel gears and clutch for the crank can be seen. This is another good idea - the crank can be turned counterclockwise but will not engage anything, so no damage can be done. Likewise, if the machine blocks, the clutch will slip before any damage to the mechanism can be done. But this was still not the end of the problems - and the last problem has not been fixed completely, because I would need a proper technical manual to show how to completely disassemble and reassemble, and make sure all the timings of the various operations are right. The symptoms are simpler to describe than the solution - the automatic division and associated carriage movement work by using the tens carry - if a tens carry occurs until the end of the carriage (i.e. 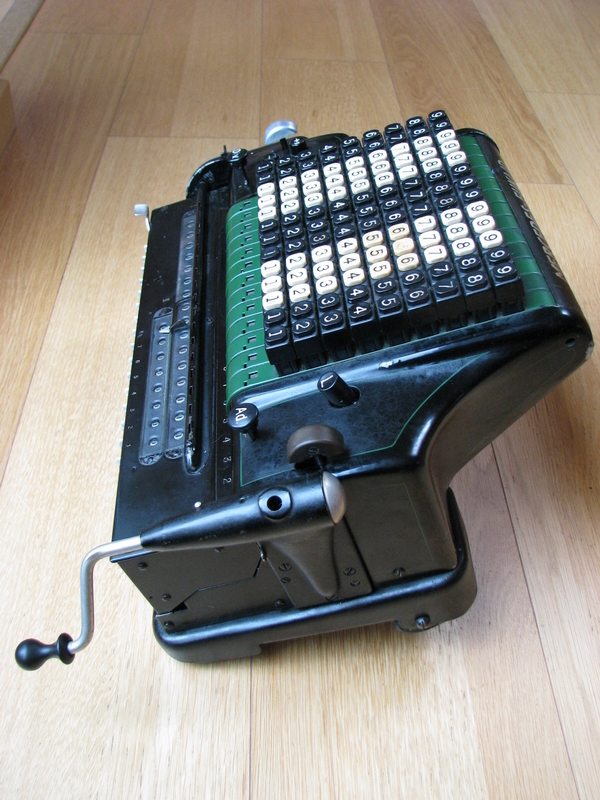 when the last subtraction yields a result below zero, or the last addition passes from 999 to 000 in the front of the carriage) in automatic division, the direction of the counter register is switched, and so is the direction of the result register, so it will now add instead of subtract. 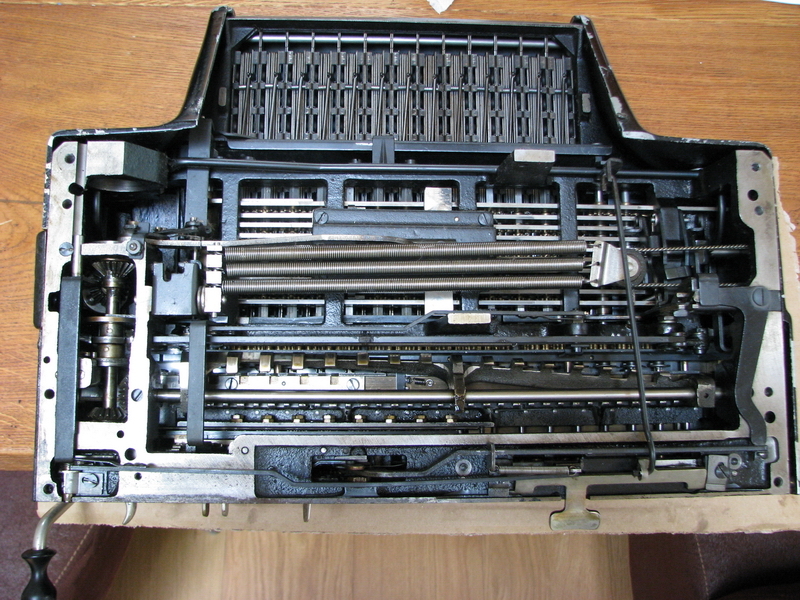 In addition, the carriage movement lever is operated, so the carriage tabs one position to the left. And there is the problem - normally, you are supposed to be able to keep turning the crank smoothly while all of this is occurring - in this machine, the operation of the tens carry roll (the long spiral skeleton structure at the bottom of the picture) in the carriage often starts before the carriage has completed its step to the left, and then either the machine blocks, or division goes completely wrong if the step is skipped entirely. There must be a timing issue, either through wear or through incorrect reassembly after a repair, that allows this to occur. The fix is easy, but sort of defeats the purpose of automatic division - as soon as the register overshoots, you know the carriage will tab - and you need to stop turning momentarily, or even turn the crank back for a few degrees, until the carriage completes its step, and then you carry on in the usual way. Annoying, and definitely not as intended, but for now I can live with it, as I am unwilling to completely disassemble the machine. Finally, there is the comma automatic. I have not seen a manual that describes its operation, so there may be features that are additional to what I can observe , but I will describe its operation with the help of division. 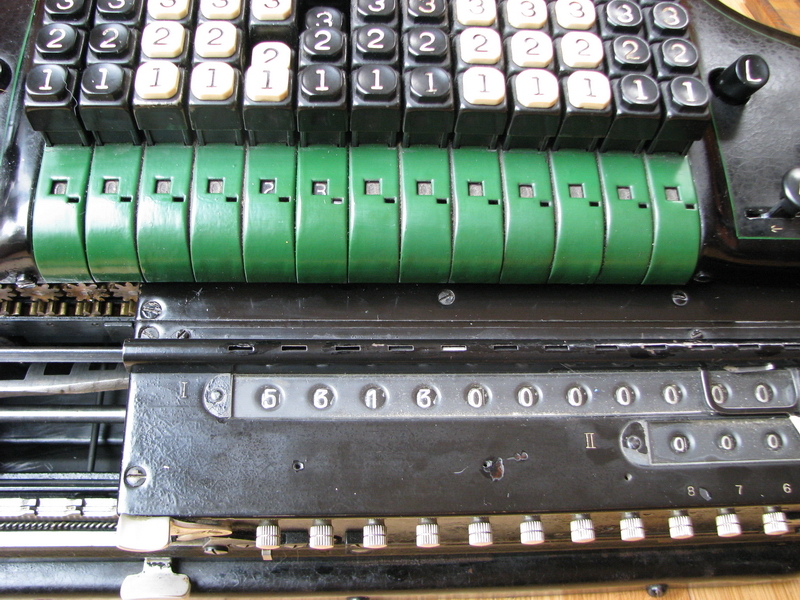 The comma automatic operates by adjusting a lever on the left side of the machine. This rotates a shaft painted with stripes under tiny windows in the keyboard. The result is that you will see an indicator moving from left to right along the keyboard. At the same time, in the carriage, a similar striped shaft rotates under slightly larger windows, and the same phenomenon can be observed. In the carriage, this striped shaft telescopes in such a way that the decimal mark which was set stays in place with respect to the carriage. A pointer in the carriage can also be used to move the comma indicator from left to right over its range, without moving the indicator in the keyboard.